I truly appreciate the work you are doing, Mary. I feel inspired by looking at it as I'm sure most people do, whether they are artists or not. Great art inspires life. Thank you for expressing your passion. The colours are so vivid, the way you paint is so alive. I love the two paintings. It is the first art you see upon entering the room. It is so welcoming. Your paintings are truly "healing images." I never knew how much beauty original art can bring into a home. We've noticed a new level of harmony and balance since your painting arrived. I love the three paintings I bought from you. They really speak to me in a way I've never had art move me. "I've loved art since I was a child and won my first drawing contest at age twelve. "Although I studied to be an oil painter, when I began working with soft pastels in 1999, I fell in love with their radiant color. I became a student of full-color seeing, attending classes with artist Susan Sarback at The School of Light and Color in Fair Oaks, California. My other art instruction includes Ecole des Beaux Arts, Paris, France, Boston University's School of Fine Art; and classes with the late Henry Hensche of the Cape Cod School of Art. "Since then I've gone on to teach full-color seeing and painting with soft pastels at several locations in the U.S. My paintings are in an Impressionist style where I suggest shapes, distance, and atmosphere via the quality of light. And much of this work informs my writing and sense of well-being. 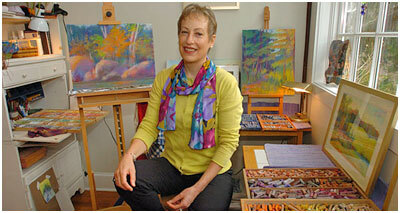 In fact, when I was diagnosed and treated for breast cancer in 1999, art was an important part of my healing process. 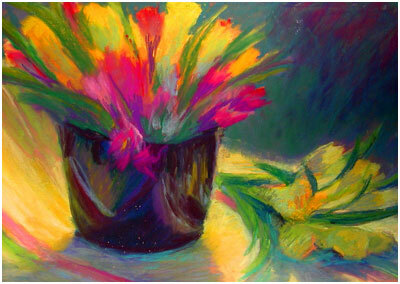 My painting 'Summer Light' was chosen for a special breast-cancer awareness calendar by Amoena Corporation." Site Design by Dénoument. Copyright © 2018 Mary Carroll Moore, Inc. All rights reserved. Last modified January 19, 2018.